December 10, 2011. This exhibit provides a nostalgic look back to the early 1900s, when Japanese immigrant families first established permanent residency in the Santa Clara Valley. 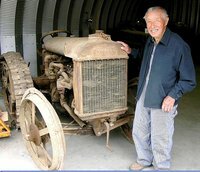 More than 100 pieces of vintage farming equipment and vehicles will be on display, including a Model T truck, wagons and tractors from 1902 to 1917. JAMsj . Last modified Dec 01 2011 7:13 a.m.